Every time I read a food magazine, I find tons of new recipes I’d like to try. But very rarely do I get around to making any of them. Most of the recipes I read in magazines and books just get filed away in my head somewhere and when I’m in the kitchen, I pull bits and pieces of information and inspiration from that jumbled library I call a brain. But every once in a while, I find a recipe like the Key Lime Coconut Cake in the latest issue of Gourmet that must be made immediately. There were so many things about the cake recipe that appealed to me: the simplicity, the flavor combination, the similarity to my favorite lemon cake. But the main reason I made the cake was to give to my friends Amanda and Tyler as a thank you for helping me survive the first week of my husband’s deployment to Iraq. I’ve spent as much time at their house as my own lately and have taken advantage of their open dinner invitation more times in the past week than they might have expected. And if you’ve ever visited either of their food sites, you know that dinner made by Amanda is a special treat! So, knowing how much Amanda loves coconut cake, I decided that I would follow through and actually give this recipe a try. I did make some substitutions, such as using regular limes instead of key limes, and cake flour and leavening rather than self-rising flour. I also used buttermilk rather than whole milk. The result was a moist, tender and buttery cake with a hint of coconut and a tart lime glaze that penetrates down through the top inch of the cake. Delicious! Whether you decide to try this version, or the original recipe at Gourmet.com, I know you won’t be disappointed with this simple and delicious cake! And thanks again, Amanda and Tyler, I hope you enjoyed the cake as much as I did! 1. Preheat oven to 350 degrees with rack in the middle. Butter a 9-inch round cake pan, line bottom with a round of parchment paper then butter the parchment paper. 2. Into a medium bowl, sift together the flour, baking powder and baking soda. Measure out 1/2 cup of shredded coconut and process in a mini food processor until very finely chopped (you can also finely chop it with a knife). Stir the chopped coconut into the flour mixture and set aside. Combine buttermilk and 2 tablespoons of lime juice; set aside. 3. Beat together butter, sugar, and lime zest with an electric mixer until very fluffy. Beat in eggs, one at a time. Turn mixer to low speed, add one third of the flour mixture, beat well, then beat in half of the buttermilk. Beat in another third of flour mixture, then second half of buttermilk. End with the last third of the flour mixture, beat until well combined, making sure to scrape down the bowl with a spatula. 4. Spoon batter into the buttered cake pan and smooth the top with a spatula. Bake in the center of a preheated 350 degree oven until golden and a wooden skewer inserted in the center comes out clean, 40-45 minutes. Cool to warm, then turn out of pan and discard parchment. 5. Whisk together powdered sugar and the remaining three tablespoons of lime juice. Poke top of cake all over with a fork then pour glaze over the cake. Sprinkle with remaining 1/2 cup of coconut. 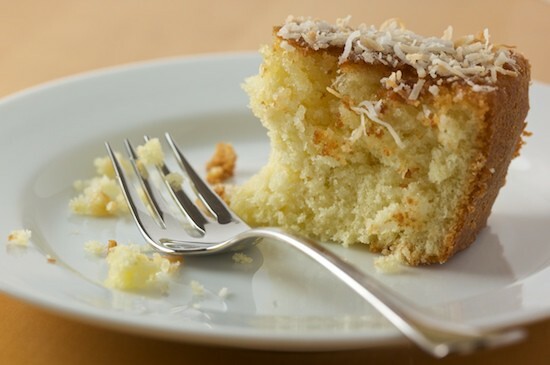 Recipe notes: Although I toasted the coconut for the cake you see pictured, I decided that I would have preferred it not toasted for this cake, as the above recipe reflects. 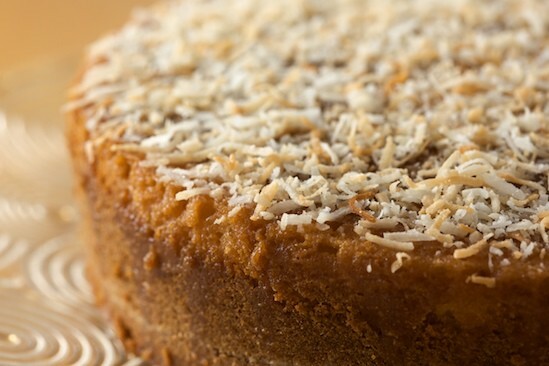 If you prefer toasted coconut, spread it out on a baking sheet and place in the 350 degree oven for a few minutes. Watch closely, it goes quickly from light brown to burnt! 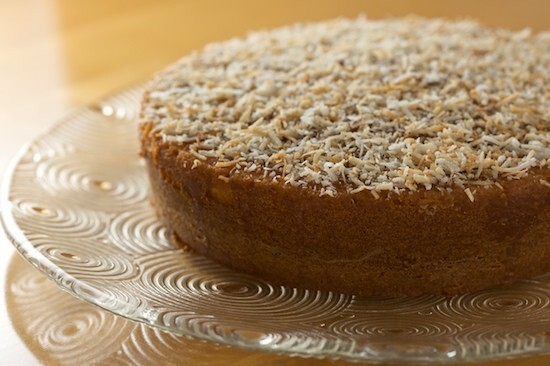 I like to finely chop the coconut that goes into the cake because I think the cake ends up with a better texture. Mini food processors do a great job, but you could also chop it up with a knife, or just skip that step entirely. Love it! A loves coconut and I love lime, so this is perfect for us! I just might dream about this cake tonight, and it's definitely going on 'the list'. Coconut and lime is the best marriage of flavors. Thanks for sharing the recipe. That cake looks soooo good! I'm am so glad that you have such great friends to keep you busy while Justin is away. I know it must be REALLY hard. I love ya! Will certainly give this a try; love anything citrus and coconut. But really just wanted to say that Blessings on You and your Husband while he is doing his Duty and Serving Our Country. May he be home SOON and SAFE. Oooh, I love the sound of this cake soooo much! I am trying to manage my way around baking here in Europe and haven't found cake flour...is it much different than normal flour? Oh nicole, my heart to you and your beloved guy. My taste buds love when you show up in my mailbox! this has been on my list as well. i'm thankful for people like your husband, but am sorry you have to be without him. we have a friend who's leaving his family for his third tour this summer.God bless. Wonderful photos and a delicious looking cake! Coconut and lime is probably my favorite new combo. Beautiful cake. Thanks for the mention. This looks beautiful and scrumptious. I love the simplicity of the recipe. May your husband be safe and well. Looks scrumptious and an easy recipe. I can't wait to try the recipe this weekend. This one definitely goes on my To Do List. Thanks for posting! Picciani's Pastry (me) also adds about two tablespoons dry coconut milk as part of the flour and Thai coconut extract which actually tastes like coconut and is not weird chemicals to any coconut cake as I really want to taste coconut. Your recipe looks yummy. absolutely DELICIOUS! moist, easy to make, and the lime was perfect. i used half coconut milk and half regular milk (instead of buttermilk). thank you so much! I'm partial to coconut cakes, too, so this sounds perfect -- especially with the lime glaze. Having a very good friend certainly is a wonderful thing, isn't it? This sounds delicious...mouthwatering...snapshots are great! I'm gonna get the ingredients from www.myethnicworld.com and try it right away. thanks for sharing the recipe. Three of my favorite ingredients, lime, coconut, and buttermilk. It has to be good. Hey there, Nicole, how are you doing?? Oooooh, that looks heavenly. I am a sucker for coconut ... and lime. Mmmmmm. I made this cake for my boyfriend's birthday. It was delicious! He loved it! Thanks for the great idea. Coconut is my weakness and this sounds perfect! Wow! This cake looks really yummy. I can't wait to try and make it! Thanks! Mmmm, this cake looks "to-die-for"! The picture is fantastic! Looks like a must make cake - would be great with a coconut flavoured cream cheese icing I imagine. Made this tonight and it is one of the finest cakes I have ever made. I was worried about the glaze after I sopped up a drip with my finger and tasted it--TART--but it mellows beautifully on the cake. The cake itself has amazing texture. LOVE this cake, very simple and just what I was looking for--a simpler version of the classic coconut layer cake for a non-special occasion. Thanks! this cake looks and sounds delicious..... i only wish it were earlier, otherwise i would start baking it now! Gorgeous cake. Yes! I think I'll make it too as my weekend cake. And how wonderful to have such good friends!!! This recipe caught my eye, too! I bookmarked it & now will move it up the "must-make" list :) My best to you & your husband both. I just made this cake as well....turned out kinda cumbly. I like your suggestion of the buttermilk instead. Love your photography! I just made this yesterday and it's fantastic! Thanks for sharing. I saw this recipe on your site and was inspired to make it. My husband doesn't like cake very much and I knew I didn't want the whole thing for myself so I thought instead of making one large cake I could use my square cupcake pan and make 12 mini coconut lime cakes that I could easily share with my neighbors (without giving them a partially eaten cake). They turned out fabulous. I just reduced the baking time and cut 12 small squares of parchment paper for my pan. They were a hit and to my surprise even my husband enjoyed them. Thank you for sharing. This was the best My family and I love it, I will be making it again. It was so moist and the glaze was fabulous. Instant favorite! We had company over for an outdoor dinner on our little Island of Saipan and it was a huge it. I used coconut from my trees and the freshness was unbelievable. I usually hesitate to try new recipes when I have people over but have not fear of this with the recipes on your site. Thank you!